12 different national symbols are depicted on this set of American Icons Memory Tiles. A little hist.. Animals Memory Tiles is our take on the classic Concentration game. Kids will have fun matching thei.. Featuring Peterson's Field Guide to Birds of North America, we have created a classic Concentration ..
Introduce the "green way" early to your children. This set of memory tiles has images for recycling,..
Shiver M' Timbers! 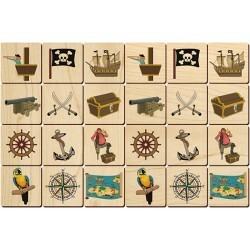 Match up a variety of pirate themes in a classic memory game. Two tiles each of 1.. The classic memory game, with a twist. The set has twelve different sports themes. The matching isn'.. Vehicle Memory Tiles is our take on the classic Concentration game. Kids will have fun matching thei..